One year ago, Jenna Liberto had what she considers a life-changing experience: a high-risk pregnancy and major health scare. But thanks to the care and compassion of a Methodist nurse, her story has a wonderful outcome. At 33 weeks, Jenna was on her second hospitalization while pregnant. She was transferred from a hospital near her home in Sioux City, Iowa, to Methodist Women’s Hospital. Diagnosed with placenta previa and accreta, she was scheduled for a cesarean section at 35 weeks. Also facing a hysterectomy and knowing the risks of both the surgery and her conditions, Jenna became terrified as her due date approached. She knew her baby would be OK, but she feared she wouldn't be around to raise her. That’s when her nurse, Connie, stepped in. Connie Klaumann, RNC-OB, has been a nurse with Methodist for 30 years. With a smile and a personality that would light up a room, she’s the kind of nurse every expecting mom wants by her side. After a few days with Jenna, Connie could see the nerves starting to take over. Those five simple words, said with care, confidence and heart, made a monumental impact on Jenna’s emotions in that moment. Jenna says her surgery went perfectly and her beautiful daughter was born healthy. And while her memories from recovery are hazy from anesthesia, she vividly remembers Connie coming to check on her. She felt comforted knowing Connie had been thinking of her and saw her on the other side of her life-changing experience. 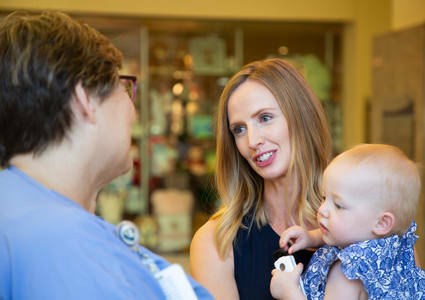 Her happy, healthy daughter just celebrated her first birthday, and still, Jenna has been reflecting on her time at Methodist Women’s Hospital. Even to this day, one of her most poignant memories of the day her daughter arrived is Connie’s reassuring calm. “I received the best care I could've imagined at Methodist, but it's because I felt so loved by people like her that I have so many good memories from what was a scary time,” she said. 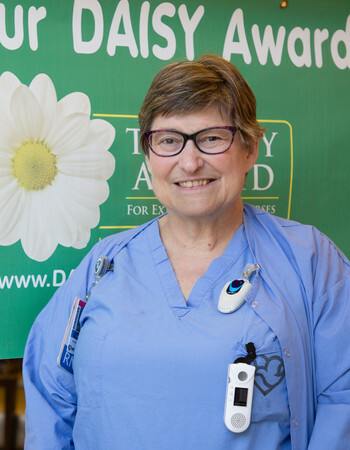 For the excellent care she gave Jenna and other patients, Connie was awarded the DAISY Award for Methodist Hospital and Methodist Women’s Hospital. It’s an honor that celebrates the extraordinary skill and compassionate care given every day by nurses like her. Read Jenna's letter to Methodist.